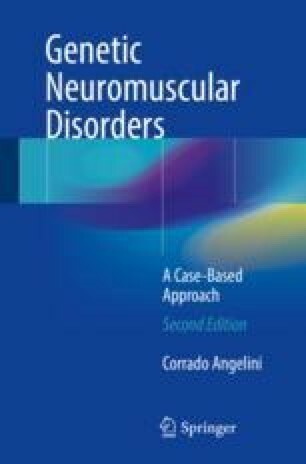 Facioscapulohumeral muscular dystrophy (FSHD) is characterized by progressive weakness of the facial, shoulder, and arm muscles. FSHD is the third most frequent form of myopathy, with a prevalence of about 1:20,000, although this is likely to be an underestimate. The onset of symptoms occurs between 3 and 50 years of age. Early onset of the disease is associated with more widespread muscle weakness. Facial weakness (difficulties whistling, smiling, and closing the eyes) is an early feature, and it is followed by shoulder muscle involvement (difficulties lifting the arms, scapular winging, and sloping shoulders). Muscle involvement progressively affects wrist extension, the abdominal muscles, knee, and foot extensor muscles. Sensory, cardiac, and neurological signs are rare. The pattern of clinical manifestations is variable, and asymmetrical involvement is frequent. A clinical score of typical signs has been developed. Molecular diagnosis is based on the identification of a deletion within the D4Z4 repeat region at 4q35 region. The identification of several of the genes involved (FRG1, SLC25A4, and DUX4) suggested that the disease results from alterations in cell differentiation. There is a correlation between the number of repeats and the severity of the disease. Penetrance is incomplete, since about 30% of mutant individual do not manifest the disease.